The Ryco filter cups are designed for easy spin on filter fitment and removal for Light vehicles. Designed to take away the frustration usually experienced during the removal and refitting of spin on oil filters located in difficult locations. The Ryco cups can be used with a ratchet with the 3/8” drive. The cup is designed specifically to suit Ryco unique fluted spin on filters. 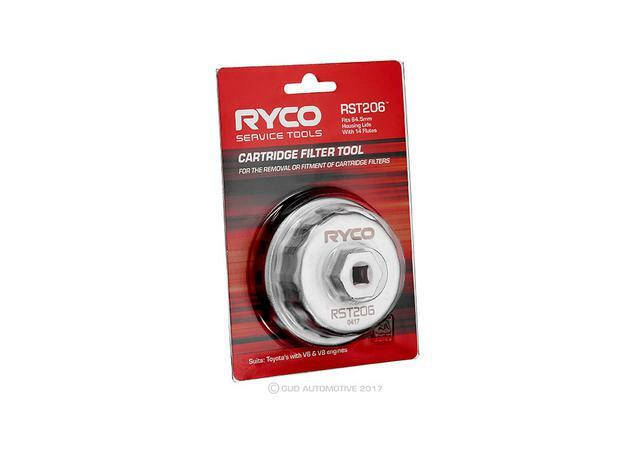 The Ryco RST206 will suit Cartridge filter applications with 64.5mm housing lids, 14 flutes. To suit Toyota V6 and V8 engines.